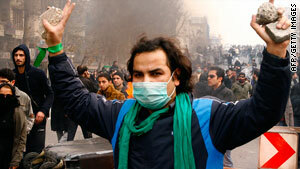 Iranian opposition groups want to avoid violent clashes when the regime marks the anniversary. Council for Coordinating the Reforms Front called for people to march "with their green colors"
(CNN) -- A coalition of Iranian reformist groups is urging opponents of the regime to stage non-violent protests on the anniversary of the Islamic Revolution next week. The Council for Coordinating the Reforms Front called Thursday for people to march "with their green colors" in support of the opposition Green Movement on February 11. Such protests represent a show of force for citizens who oppose the government's stiff crackdown on people who demonstrated against the June election victory of President Mahmoud Ahmadinejad, a vote regarded as fraudulent by many. "We will show all of the small-minded people who sit on the thrones as rulers, and label any opposition as tools of foreign enemies, the fate of single-voiced [autocratic] systems and establishments," the council said in a written statement. The statement was issued after opposition leaders such as Mir Hossein Moussavi and Mehdi Karrubi called for non-violent protests, to make reformists' "voices heard to comrade and competitor" and "friend and foe." "We come to scream on behalf of the political prisoners, most of whom were present in the 1357 revolution  and tell them [the authorities] that in lieu of imprisonments and violence against the people, you must return to the fundamentals and the original values," the statement said, making reference to the years in the Islamic calendar. "We will tell them to respect the laws and instead of voicing unfounded and fabricated concerns about [foreign] plots, to be more in tune with analyzing their own actions. We will tell them that the mirror shows an accurate reflection of who you are and if you break that mirror, you only break yourself." Among the groups in the coalition are the Participation Party of Islamic Iran, the Organization of the Mujahedeen of the Islamic Revolution of Iran, the Association of Parliamentary Representatives, the Islamic Association of University Instructors, the Iranian Women's Journalist Association, the Cultural Association of Islamic Iran, the Unity Party, and the Association of Teachers and Researchers of Qom Seminary School. Authorities are holding a series of events to commemorate the Shah of Iran's overthrow in 1979. Celebrations began this week and will culminate on February 11. The government appears to be trying to clamp down even more tightly on opponents as the anniversary approaches. A leading Iranian human rights activist and journalist was arrested Wednesday, activists said. Kaveh Ghasemi Kermanshahi was taken by security agents who searched his home and took personal belongings, including his computer, the International Campaign for Human Rights in Iran said in a statement. Iran has been trying and executing people accused of demonstrating against the June 12 presidential election victory of Ahmadinejad. The initial protests broke out last summer and have persisted. At least seven people were killed and hundreds arrested, witnesses said, as they took to the streets on Ashura, a Muslim holy day that occurred on December 27.